The number of people made homeless by flooding in north-east India and Bangladesh has risen to some 1.5 million, officials say. India's Assam state is suffering its third wave of floods this year, caused by heavy rains over the past four days. 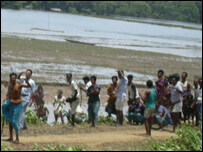 The army has evacuated 800,000 people as the Brahmaputra rive and its tributaries flow at danger levels. Downstream in Bangladesh, officials say half a million people are affected and many have been moved to safer places. In Assam state, thousands of village homes, bridges, electricity poles and telecommunication towers have been washed away by the flooded rivers and 13 people have died. The national highway that connects Assam - and all other northeast Indian states - to the rest of the country is under several feet of water in more than 10 places. Thousands of trucks carrying essential supplies and buses carrying passengers are stuck on the highway . "These are the worst floods this year. The losses are huge," Assam government spokesman Dinesh Deka said. Mr Deka says the floods struck when agriculture was picking up after two waves of floods in July and August. "This third wave of floods will ruin farmers who had replanted crops lost in last month's flooding. This will surely affect Assam's agricultural output this year," Mr Deka said. Assam's relief minister Bhumidhar Barman told the BBC the army has been called to help rescue thousands of marooned people and reach essential supplies in flooded areas. "Now we are focussing on rescue operations and the army has been called to help us. But I can tell you people will find no respite until the rains stop," Mr Barman said. Since the annual monsoon rains began in June, about 50 people have been killed in Assam and more than 12 million have been people affected, including in the latest wave of flooding. In the state's capital Guwahati, several residential areas are under waist-deep waters, forcing many residents to move in with friends and relatives living on higher ground. "Incessant rains have caused severe water logging," said city resident Nanigopal Mahanta. "Driving around is a nightmare." Landslides in others parts of the northeast region blocked highways and stranded thousands of trucks carrying essential goods, such as food supplies. Southern Assam's Barak Valley region and the states of Tripura and Mizoram are cut off by road and rail due to landslides. Floods have also affected large parts of Manipur state. As water levels continue to rise, villagers have moved to higher ground using boats or rafts made from bamboo and banana trees, leaving behind their belongings and livestock. In neighbouring Bangladesh too, the situation continues to remain grim with more than half a million people being forced out of their homes by the swirling waters. "You see, the whole village is in waters, we are suffering a lot, we have no food, our houses are under water, we are enduring very painful days," Mofazzal Hossain, a local villager, was quoted by news agency Reuters as saying. 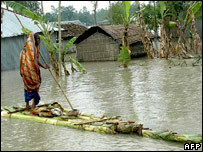 It is the second wave of floods in Bangladesh in less than a month. After the first spell of flood waters subsided, people went back to their homes to assess the damage. But fresh floods have forced them to return to the shelters again. The flooding has also affected the neighbouring Himalayan kingdom of Bhutan where several fast-flowing mountain streams are changing their course, flooding human settlements. Landslides on several highways of the kingdom have blocked vehicular traffic. The regional weather office in Assam has predicted more rainfall over the coming days. Since July, more than 2,000 people in eastern India and neighbouring Bangladesh have been killed by snake bites, drowning, diarrhoea and from houses collapsing after swollen rivers burst their banks as a result of incessant monsoon rains. What is the South Asia monsoon?